In the Shadows alternates between two related stories, one told in text and the other entirely in pictures. It's hard to talk about In the Shadows without risking revealing too much. The stories themselves unfold gradually, and at first it's hard to understand what's going on or how the stories fit together, but as the details unfold the pieces start to come together. The text portion alternates between five young people: Cora and Minnie, whose mother runs a boarding house in a small town in Maine; Arthur, a mysterious young man who comes to the boarding house; and two brothers, Thom and Charles. Charles is dying from a terminal illness, and their father sends the two young men from New York City to Maine for Charles' health, although a conversation that Thom overhears between his father and a woman seems to indicate a more sinister reason. The five teens begin to suspect that there is evil lurking in the town, and all five of them are linked to it in some way. The art story depicts a young man traveling around the world, apparently searching for something or someone. We don't know who he is, and at first it's hard to understand what's going on or what the connection is with the text story. By about halfway through, you begin to suspect, and then later details in the text story make clear what's happening in the art story. In the Shadows is an intriguing, beautifully made book. I love this kind of story, where the connections aren't always clear and you have to puzzle it out as you go along. I actually found that after I finished the book, I wanted to go through the art story again from the beginning to pick up on all the details and fully appreciate it. The text story is well-written and holds your interest, the art is beautiful, and the two fit well together stylistically. There is a dark, creepy, and mysterious feel to both stories. With evil lurking in a small town in Maine, it's hard not to compare this to Stephen King, but stylistically it's not really similar to King's writing. The compelling story and short chapters conspire to keep you reading; "Just one more chapter," I kept telling myself. Other than a few incidental characters in the pictures, I didn't see any diversity. With the short chapters, artwork, and fast-paced read, this may be a good book for reluctant readers. Graphic novel readers may also enjoy it, even though it isn't strictly a graphic novel. 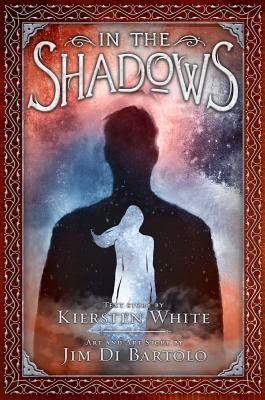 Any teen or adult who enjoys dark, creepy stories with mysterious conspiracies will enjoy In the Shadows.